The weekend greets me with yellow sunlight splashing through my eastern facing windows. It’s, as always, a beautiful day out there, and I envision, along with my lazy morning, a slow few days of late brunches, leisurely wandering, people watching, window shopping, coffee dates. This perfect weekend, however, doesn’t quite exist in Los Angeles. I know, because I’ve lived it elsewhere, but never here. Here, it is just a vision, a dream, and to become reality it requires one thing: mass transit. A thorough system that can facilitate a weekend of strolling about, exploring new and familiar areas, being a loiterer, a consumer, ending each day with the slight but envigorating fatigue that comes with experiencing a city on foot. As it is, I must amend my vision to include hours of sitting within the confines of my car. 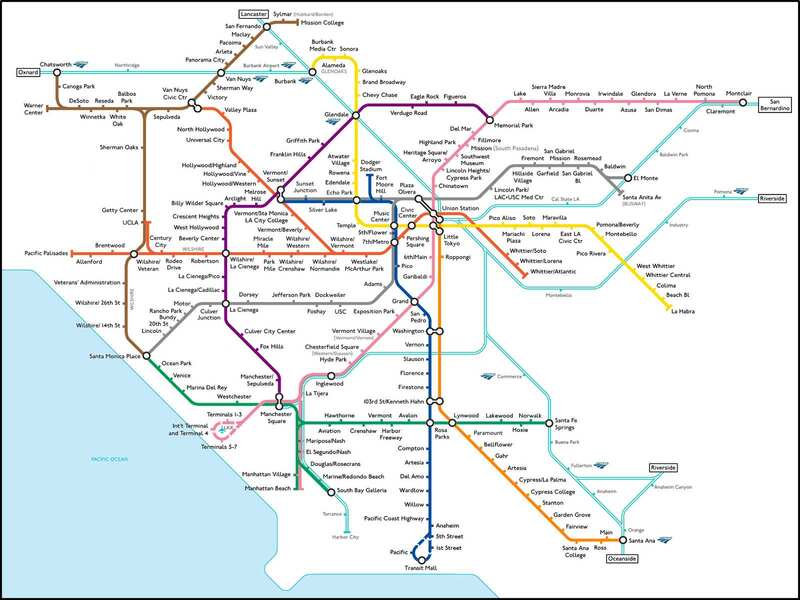 Some brilliant mind (specifically Numan Parada, an L.A.-area mapmaker) drafted this wishful map of what LA Metro could be. That is, a system for actually getting people around and about. Not just sort of, but really. A system that everyone would depend on (let alone, know about – I live near the Hollywood/Western red line station and when mentioning this fact, I have, on more than one occasion received the response from fellow Angelenos, “There’s a subway in LA?”). Five lines (the orange one is a bus line and rather ineffective one at that – I know, because I’ve ridden it) serving none of the most visited areas of LA. See that white space between the green and orange lines? There lie the neighborhoods you want to visit – that is, Hollywood, West Hollywood, West LA, Culver City, Venice, Marina Del Mar, Brentwood, Westwood, Santa Monica, Malibu, Pacific Palisades. How do you get to those neighborhoods? You drive. That is, if sitting in traffic can be called driving. 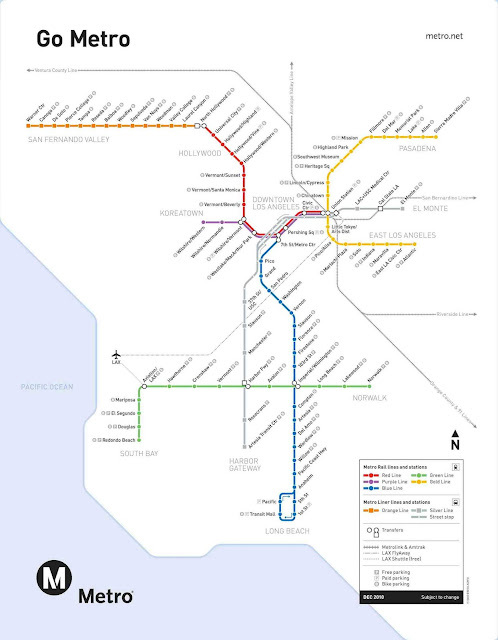 There are people and organizations in LA working toward building a campaign for more extensive metro. And, of course, there are people and organizations in LA opposing these campaigns. Their arguments against investing in rail consist of the amount of money it would take (potentially billions of dollars), the ‘antiquated’ technology of rail, the hazards of digging tunnels in an earthquake zone (does nobody remember the collapsed freeways of 1989) or in the dry desert. “the nature of the soil would make tunnelling particularly difficult because it consisted of sands saturated with water and dry sands, strata of different clays which permeated with cracked water-bearing and massive limestone, old washouts and quicksand. Many underground rivers were discovered. During the construction of the tunnel section between Sokolniki and Okhotny Ryad alone the miners had to cross four water flows.” – see The History of the Moscow Metro. Yet, despite the dangers and hazards, and seemingly prohibitive cost (metro projects were repeatedly dismissed for three decades due to high cost), the thing got made. And it’s one of the world’s most thorough and effective rapid transit systems (I know, because I’ve ridden it).